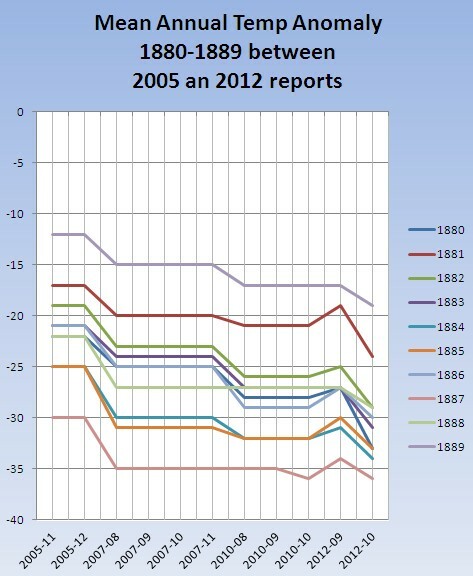 Grandfather David has been capturing GISS data from archives and plotted how the 1880s have been progressively cooled over the last seven years. Goebbels had nothing over Hansen when it came to embellishing the big lie. It’s outrageous. What is the excuse of altering long standing records? This is not science! Hansen and his crew should by subjected to some form of scrutiny – but there appears to be none. Why did Hansen adjust it up a notch in September? Did he have a feeling that someone of power was going to call him on his actions? Or did he think that that was enough to fool everyone so know one would notice the trend?